WASHINGTON — President Obama and President Dilma Rousseff of Brazil announced a series of agreements on Tuesday to address climate change, as Mr. Obama continued to push other countries to enact policies to cut planet-warming emissions before negotiations in December to complete a global climate change accord. The two leaders pledged to increase the use of wind and solar power sources to 20 percent of each nation’s electricity production by 2030, which would triple power generation from renewable sources in the United States and double it in Brazil. Brazil also pledged that it would restore 12 million hectares — nearly 30 million acres — of Amazon rain forest, an area about the size of Pennsylvania. The United States and Brazil also established a joint climate change working group in which high-level officials will look for ways to reach new deals on emissions. The working group is modeled after a similar one between the United States and China, which led to the announcement in November that the two countries, the largest greenhouse gas polluters, would commit to new reduction targets. The United States has also established a working group with India, the third largest greenhouse gas polluter. Brazil is one of the world’s top 10 greenhouse gas emitters, although most of its emissions come not from burning fossil fuels for electricity but from the mass deforestation of the Amazon. Deforestation is a major source of pollution because when trees are cut down, they release the carbon dioxide they are storing. The Brazilian government has historically resisted pressure from other governments to reduce its emissions, saying that much of its population is still in poverty and that deforestation of the Amazon for farming and other activities is necessary for economic growth. Brazil did not announce any overall targets for pollution reduction along the lines of Mr. Obama’s pledge in November that the United States would cut emissions up to 28 percent from 2005 levels by 2025, and President Xi Jinping’s pledge that China’s emissions would decline after 2030. Brazil appears to be months away from submitting a formal plan to the United Nations detailing how it will cut its emissions. At a summit meeting in December, countries agreed to submit such plans to the United Nations by June of this year, well in advance of the December gathering in Paris. The United States, the European Union, Canada, Russia and Mexico are among the countries that have submitted plans, and Chinese officials announced Tuesday that they would submit theirs immediately. 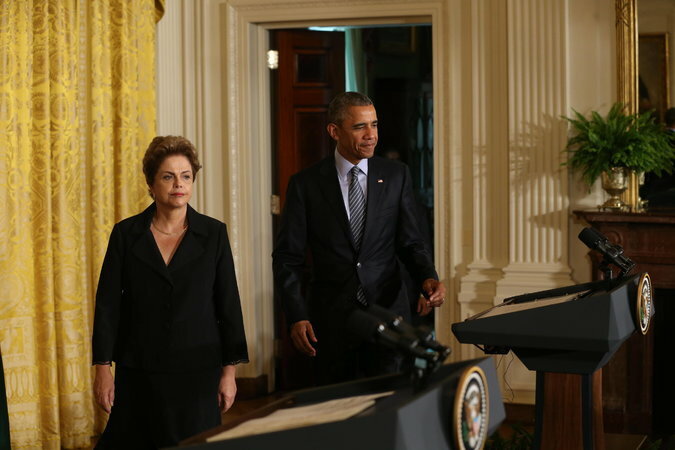 Ms. Rousseff said Tuesday that Brazil was on track to submit an ambitious plan. Both she and Mr. Obama said they would support efforts not only to reach a global accord in Paris, but also to strengthen the terms of that accord in the following years to require steeper emissions cuts.